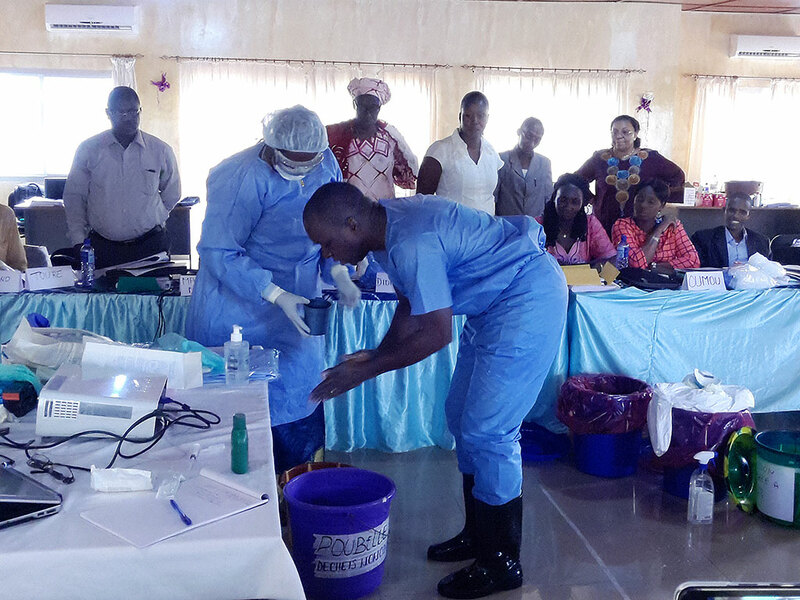 Participants in an infection prevention and control training in Guinea learn key skills. Conakry, Guinea—Dr. Thierno Souleymane Diallo is a formidable ally in Guinea’s race to prevent and contain the spread of the deadly Ebola virus among women and families. As a survivor of the disease, he is championing with colleagues the infection prevention and control (IPC) skills that can save lives. He spent 21 days in an Ebola treatment center. “Sometimes I prayed to God to let me sleep, to forget my state … and when I woke up, I felt like my entire body was full of lead,” he said, of his terrifying battle against the Ebola virus. Upon his release from the treatment center, Dr. Thierno spent another two and a half months recovering at home because of joint pain. After returning to work, he participated in an IPC update and refresher training for health workers during which he learned the importance of following proper IPC practices, especially during the Ebola outbreak. The five-day training was organized by the U.S. Agency for International Development’s Maternal and Child Survival Program (MCSP), which is led by Jhpiego, in conjunction with the Ministry of Health in Guinea. The training used lectures along with simulated practical sessions and site visits to health facilities to allow for hands-on demonstrations of proper IPC to protect providers and their patients. Dr. Thierno is now among 27 providers with updated skills who are managing a large-scale training, under the guidance of the MCSP team, for 2,200 Guinean health care workers in IPC practices adapted for Ebola-impacted countries—nearly 1,000 have been trained so far. Dr. Thierno and the other trainers are also providing follow-up supportive supervision every two weeks as part of the Ministry of Health’s concerted efforts to keep frontline health workers safe and prepared to serve Guineans who may become ill. He and another Ebola survivor are sharing their personal experiences with the disease; as survivors, they are thought to be immune to the virus, but nevertheless are implementing IPC procedures fully. On some days, Dr. Thierno recalls, he was so disoriented that he did not even recognize his wife when she came to see him at the designated visitors’ area of the Ebola treatment center. During this time, the doctor suffered from bloody diarrhea, nausea, indescribable body aches and constant 104-degree fevers over long periods. Dr. Thierno believes that the main reasons he contracted the disease were that he, like other providers at the facility, used only one glove on one hand during patient treatment in the maternity ward and that the solution of chlorine prepared for disinfection was not the proper concentration. In subsequent trainings at his facility, Dr. Thierno has reinforced to colleagues that one glove is not an acceptable practice. The survivors offer valuable insight to providers they train about why such IPC measures are critically important. Their stories also highlight a key lesson for early care-seeking for suspected Ebola Virus Disease, given that survival is higher for those who initiate care with the first sign of symptoms, as Dr. Thierno did.